George HW Bush died late Friday in his home surrounded by his family. He was 94 years old and the 41st US president. 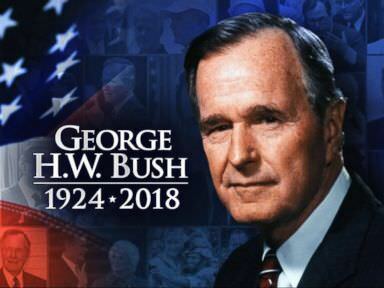 Bush was a World War II combat pilot, senator's son, student-athlete, a Republican congressman, diplomat, spy chief and a national party chairman. He first won the 1988 election and was the US president until 1992 (4 years). He lost to Bill Clinton, who when he learned of Bush's death said that he and Hillary gave "thanks for his great long life of service, love and friendship." The Whitehouse has also been paying its respects to Bush by lowering the US flag to half-staff. Wednesday 5th December is set to be the national day of mourning, it wasn't clear whether or not the funeral would take place on the same day, but there will be an announcement soon. George Bush Jr, the son of George HW Bush who went on to serve as the 43rd US President, said in a statement. "Jeb, Neil, Marvin, Doro, and I are saddened to announce that after 94 remarkable years, our dear Dad has died." Bush had remained active well into his old age. He had celebrated at least three birthdays since his retirement with parachute jumps, including one to celebrate his 90th birthday in June 2014. Bush was confined to a wheelchair after being diagnosed with a rare condition known as vascular Parkinsonism. Although he was in a wheelchair, he still had his colourful personality and enthusiasm. WILL YOU Be paying your respects to George HW Bush?